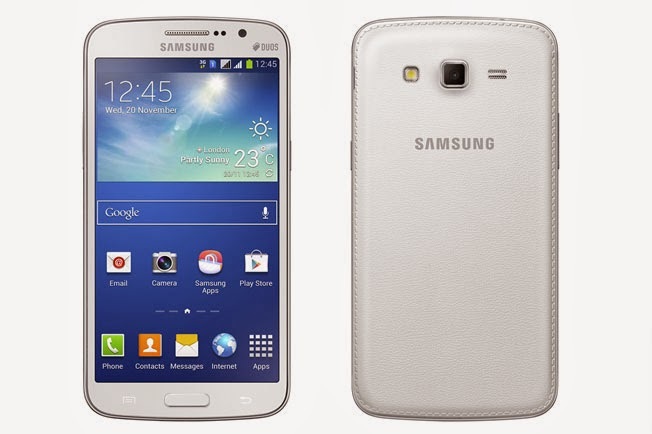 Samsung unveiled the Galaxy Grand 2 in November this year. Today, at an event in Mumbai, the South Korean company launched the device in India and will make it available across the country from first week of January. The phone is likely to be priced between Rs 22,900 and Rs 24,900. 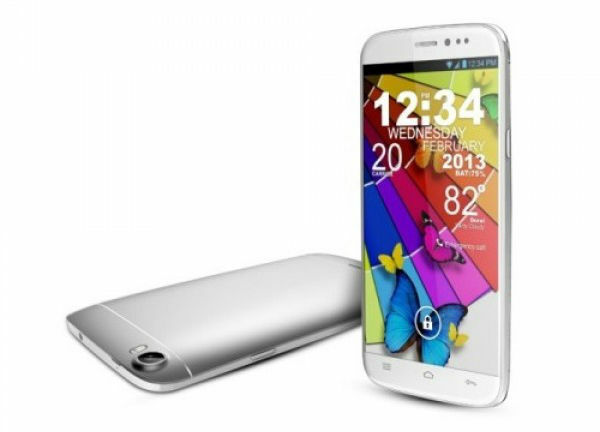 The Galaxy Grand 2 is successor to the Galaxy Grand with an improved set of features compared to its predecessor. It now features a bigger 5.2-inch 720p display compared with the 5-inch WVGA display on the former. 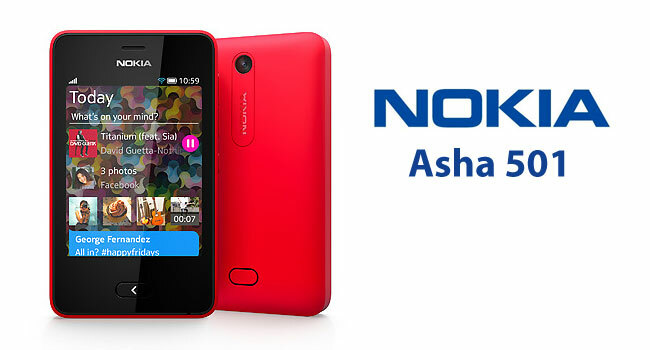 It is powered by a 1.5 GHz quad-core Qualcomm processor paired with 1.2 GB of RAM. 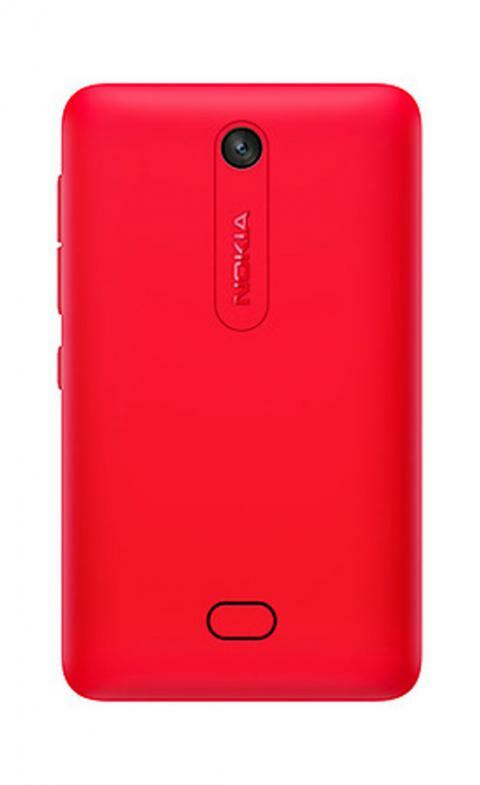 It offers 8GB of internal storage that can be expanded up to 64GB using a microSD card. Other features include an 8-megapixel rear camera with LED flash and support for 1080p video recording, 2-megapixel front camera, and a 2,600mAh battery with up to 10 hours of playback and 17 hours of talktime. 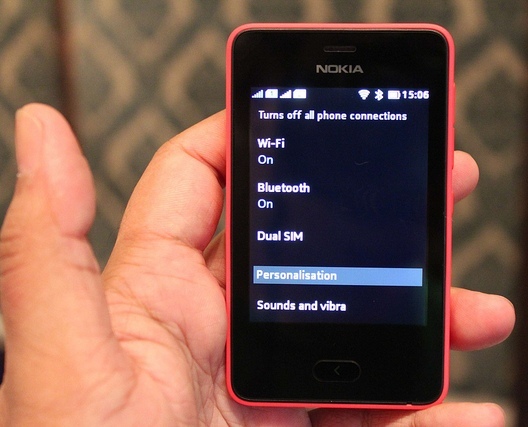 Connectivity options include 3G (HSPA ＋) support, Wi-Fi, Bluetooth v 4.0, and GPS. 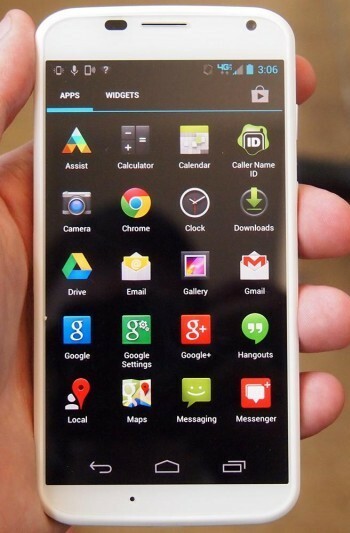 The Galaxy Grand 2 is a dual-SIM device with support for GSM+GSM and runs Android 4.3 Jelly Bean out-of-the-box. It also brings Samsung apps like ChatON, Samsung Hub, S Health, Group Play, S Travel, S Translator, Samsung Link, and Story Album. The Samsung Galaxy Grand 2 will be available in Black, Pink and White colour variants in select regions. 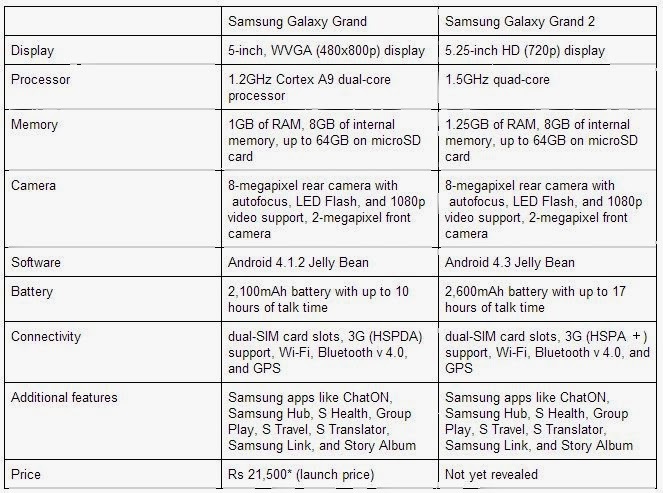 Here’s a comparison between Galaxy Grand and Galaxy Grand 2. Celkon has launched its first AR Rahman-themed smartphone named the AR45 under its newly introduced RahmanIshq series, which is dedicated to the Indian music maestro AR Rehman. As the name suggests the company is promoting this smartphone as a music-oriented handset with dual speakers, and has priced it at Rs 7,999. AR45 will be available from October. “I always believe that technology is very important in the world of music. RahmanIshq stands testimony to this and is a concept dedicated to spreading awareness of how technology needs to blend seamlessly with music for optimum output. It is wonderful to partner with such an innovative brand for my first road tour. Thank you for all the support extended.” AR Rahman said at the launch. The Celkon AR45 will sports a 4.5-inch FWVGA display with 480X854 pixels resolution.It includes a MediaTek 6572 dual-core chipset clocked at 1.2GHz and is coupled with 512MB of RAM. There is a 4GB of internal storage which can be expanded up to 32GB using a microSD card. 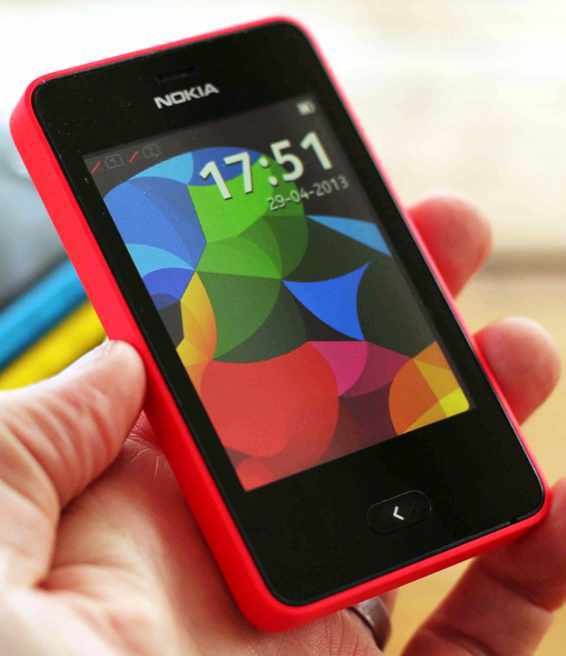 The device runs Android 4.2.2 Jelly Bean and supports dual-SIM with dual standby. The RahmanIshq AR45 also comes with a 5-megapixel rear camera alongside an LED flash and a VGA front-facing camera. Other features in the phone include dual speakers with K class amplifier, wireless connectivity support for Wi-Fi, Bluetooth, 3G network and GPS. The device also includes a 2000mAh battery. Last week we reported about Micromax’s plans to launch a new flagship device that would compete Samsung’s Mega series of phablets. 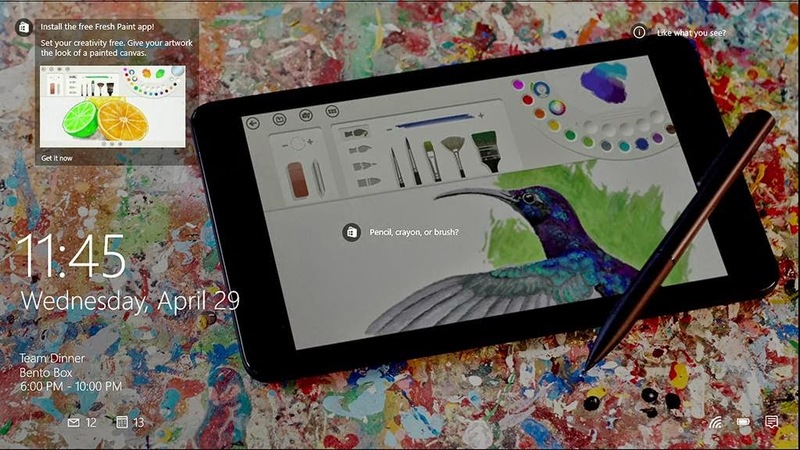 Now, the Canvas Doodle 2 as the phablet is known could be close to a launch. 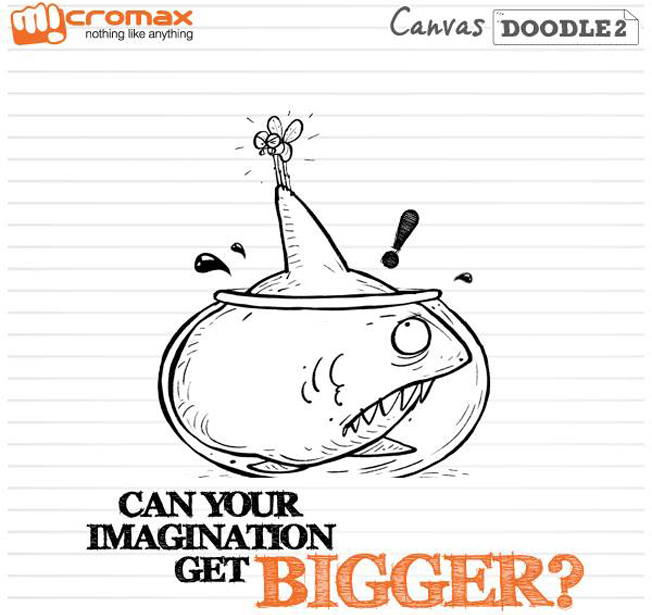 Micromax has posted a photo on Facebook that depicts a hand-drawn doodle followed by the tagline “Can your imagination get bigger?” and the name Canvas Doodle 2 at the top. In the comments section, the company has written that they will be launching the device in the coming weeks. On the specifications front, Device will be featuring a 12-megapixel rear camera and a 5-megapixel front-facing camera. A MediaTek MT6589 chipset hums under the hood with Cortex A7 quad core processor clocked at 1.2GHz. It comes with 1GB of RAM and 16GB of internal memory with a microSD card support. The Canvas Doodle 2 runs on Android 4.2 and will come with Micromax’s own touches on top, which we believe will include all the customizations we saw in the Canvas 4 including the vertical panorama mode, the new video player and could even include the tacky blow-to-unlock mode. It comes with a 2,600mAh battery and considering the hybrid rear casing, we have our doubts whether it would have a removable battery. The larger footprint and use of a metallic back casing ensures that the phone weighs 220grams which is not-so-comfortable. 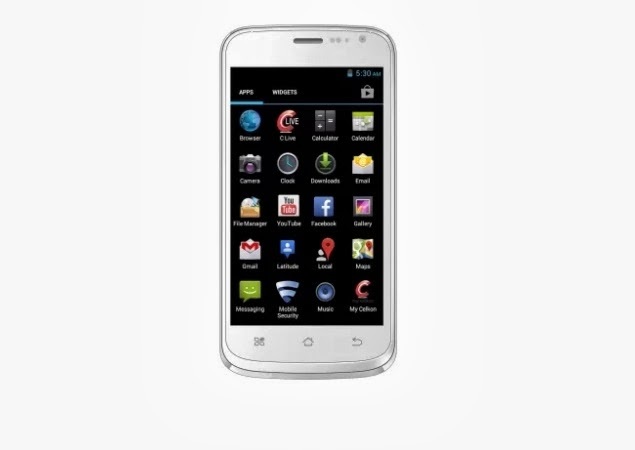 Micromax is reportedly launching this phone some time this week and is expected to price it at around Rs 18,000. 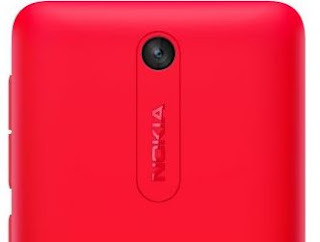 The device will take on Samsung’s Galaxy Mega 5.8, which is currently priced at approximately Rs 23,000. Not only will Micromax play on the pricing but will also market the specifications, which are better on most counts. It’s been a long time coming, but today, we finally got our hands on the Moto X, the first phone Motorola co-designed with Google. With the fresh announcement of the $199.99 Moto X, Motorola, plans to rewrite history and put its rivals on the defensive. 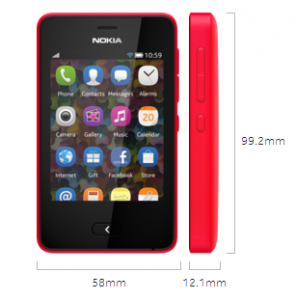 it’s a nimble, compact handset that targets ordinary phone users with advanced abilities. Backed by its corporate parent Google, the Moto X boasts many of the skills its new Verizon Droids flaunt, plus a few slick extras. Better yet they’re all crammed into a highly customizable design built for maximum comfort. The phone itself is great, but the real selling point is how customizable it is. Motorola has taken a lot of time to choose the right size, shape, and button layout for its phone. With a 4.7-inch screen, it pushes no screen size boundaries, but it’s one of the most comfortable phones we’ve ever held. A Googorola executive told us that the phone has been designed to fit the shape of your palm perfectly. The body is made of polycarbonate plastic that bleeds right into the Gorilla Glass on the front, and the back of the phone has an arc to it. The Power and Volume buttons are placed on the right side so that they can be easily pressed right alongside the Home, Back, and Recent Apps navigation buttons on the bottom of the X. It’s this attention to detail that makes it a thrill to hold the X. The phone is fantastic to hold and use, but Motorola’s custom manufacturing process is what sets it apart from anything else on the market. Instead of just buying a black or white phone, you can order it on Motorola’s new “Moto Maker” website. 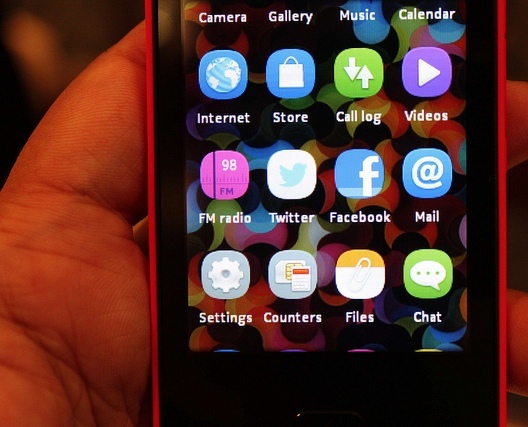 It allows you to completely customize your phone in 2,000 different combinations. 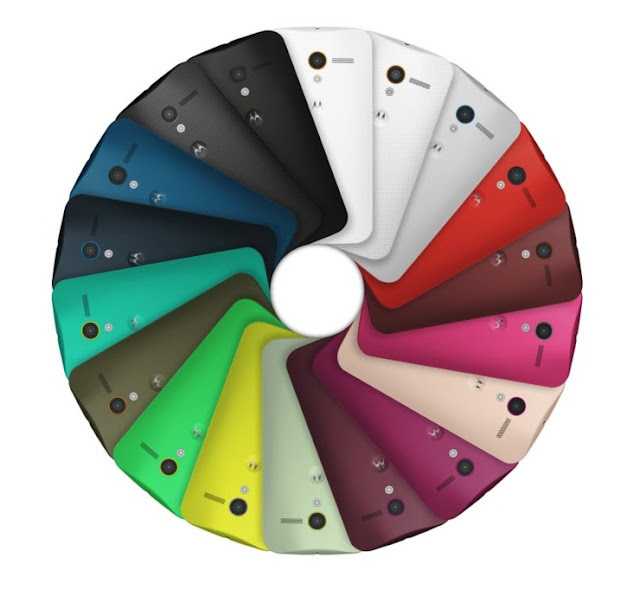 There are 18 different backplate colors, seven accent colors (the color of your power, volume, and camera ring), two front plate colors (white or black), two different types of cases, two storage size options, 16 wallpapers, and many other options. You can even put a written message on the back and buy Sol headphones that match your device. 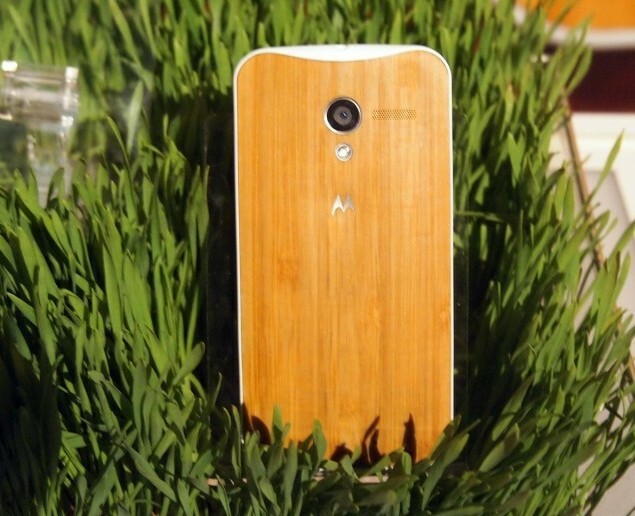 Wood backplates will also be available soon, and Motorola plans to continue rolling out new designs after launch. By contrast the Moto X’s 4.7-inch 720p (1,280 by 720 pixels) OLED screen is quite large. 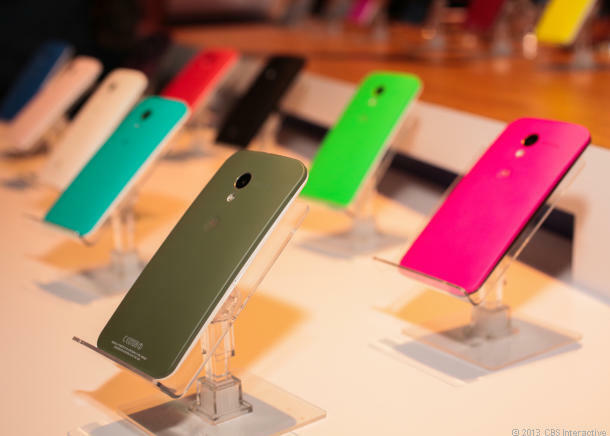 The Moto X’s OLED screen technology produces vivid colors, deep blacks, and wide viewing angles. 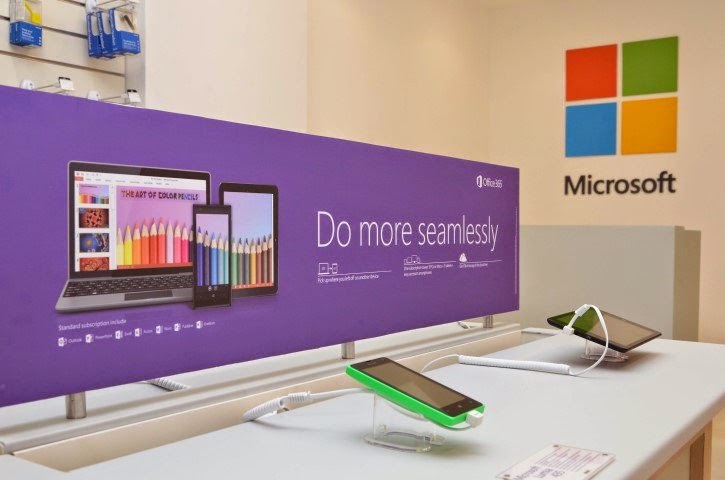 Of course a display’s impact isn’t based on just resolution, brightness, and color quality. 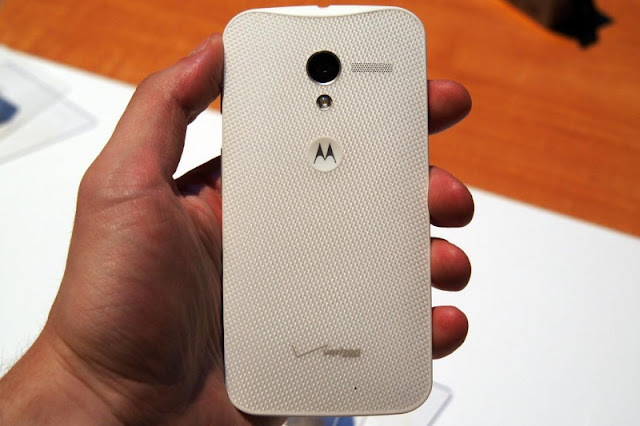 Case in point: the Moto X’s screen has an extremely thin bezel that lovingly hugs the front edges of the handset. 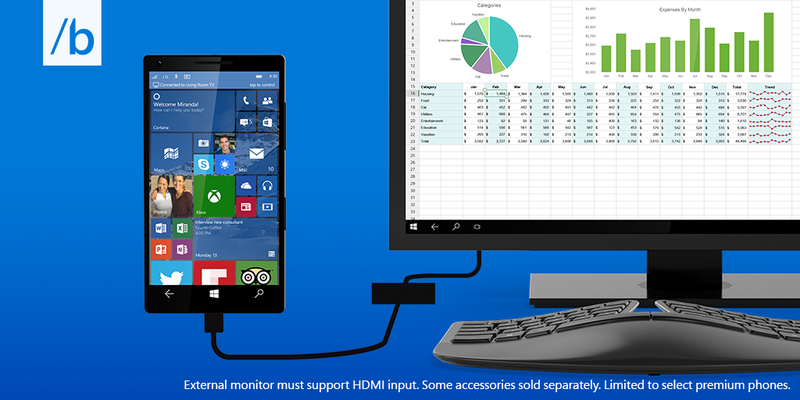 This helps the X’s display appear larger than life and command your attention. Since Google owns Motorola now, the Moto X’s interface mostly sticks with the standard design and feel of Android 4.2 Jelly Bean. On the inside, the specs are pretty good. It has a 1280 x 720 pixel AMOLED screen (and we swear, it pretty much looks as good as 1080p), 2GB of RAM, a 10-megapixel camera, 16GB of internal storage (32GB for extra $50), and Motorola’s fancy new X8 chipset, which includes a Snapdragon S4 Pro dual-core processor, a quad-core GPU, a language processor, and a “contextual computing” processor. Those last two chips are specifically designed to help it hear your voice and understand what’s going on around it via an array of sensors. 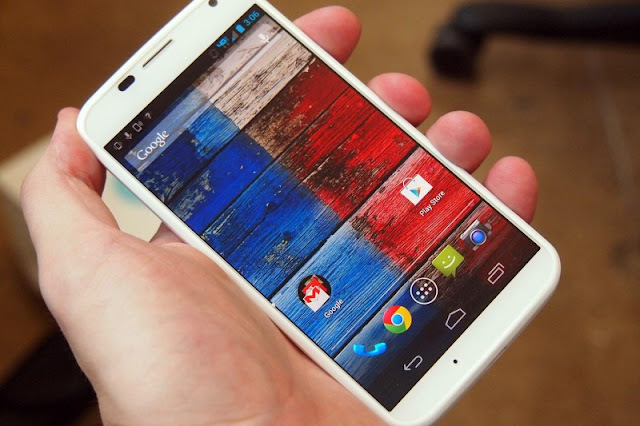 The phone runs Android 4.2.2 Jelly Bean rather than latest flavor of Android Jelly Bean (version 4.3). 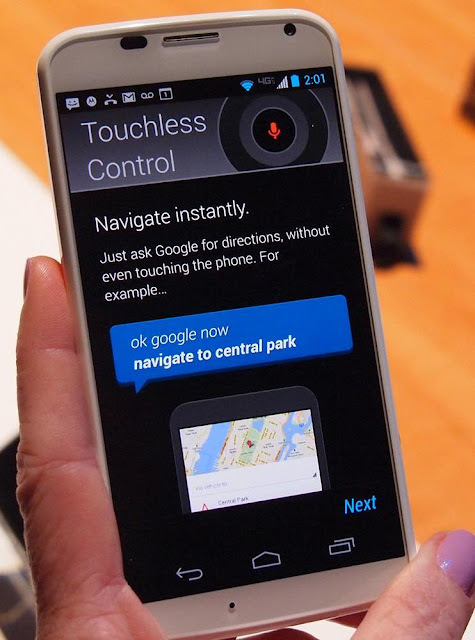 .Motorola has teamed up with Google to add plenty of neat tricks, the most notable of which is contextual computing, which company refers as the Touchless Controls, which utilize Google Now to answer questions for you. What’s different here is that you don’t even have to wake the Moto X from sleep mode to use Google Now. You can yell at it from across the room. It’s now possible to wake your phone up using voice commands. And it recognizes your voice thanks to three microphones, active noise canceling, and a voice profile that you help it create by saying some words for it a few times in a row. Active Display mode also caught our eye. It shows you the time and some recent notifications every time you move your phone. Execs told that the average smartphone owner presses the Power button and looks at their screen 60 times a day. With this feature, the information you need may pop up faster. Aside from these slick voice capabilities, the Moto X’s interface essentially remains the same as stock Jelly Bean. The five home screens, application tray, and widgets are pretty much identical to what you’d see on Google-approved machines. 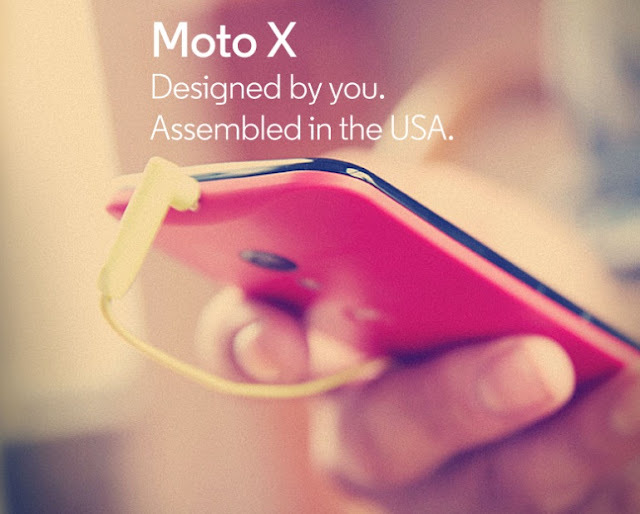 The Moto X will softly pulse important notifications and alerts on the screen, even when asleep, as they occur. Motorola says this will help users conserve battery life since they won’t have to power up the display each time the notification light flashes. Holding your finger on the center of the screen (and notification) causes the X to display additional details for the alert. Dragging your finger upward takes you directly to the corresponding message if you decide more action is required. Equipped with a 10-megapixel “Clear Pixel” RGBC sensor and LED flash, Motorola says its new device can snap pictures with speed. It goes on to tout the Moto X’s ability to grab 75 percent more light than competing smartphone cameras. That should result in lower shutter times and clearer images under dark conditions. The camera app, called Quick Capture, has also been revamped to be cleaner and more efficient. 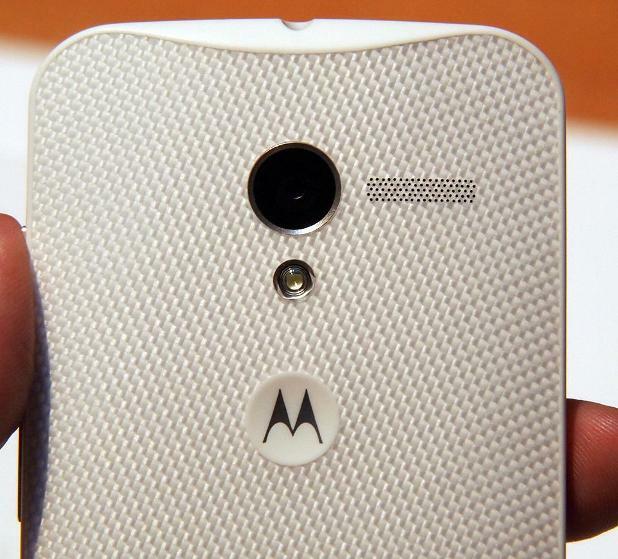 With it, the Moto X will go from pocket to image capture in under 3 seconds. Just grab the phone, turn it twice in your hand horizontally, and the camera launches without pressing a button. 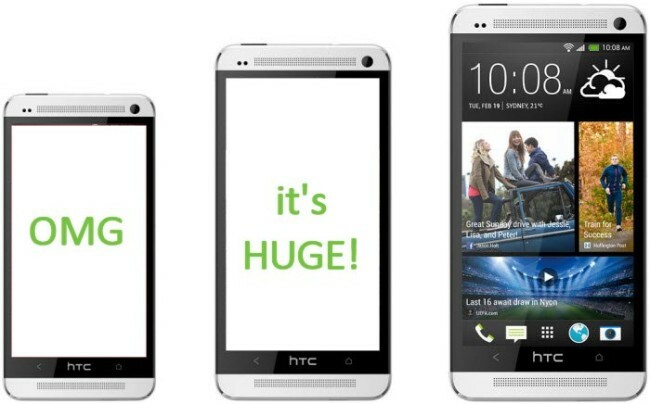 The handset certainly packs in plenty of interesting abilities and functionality. 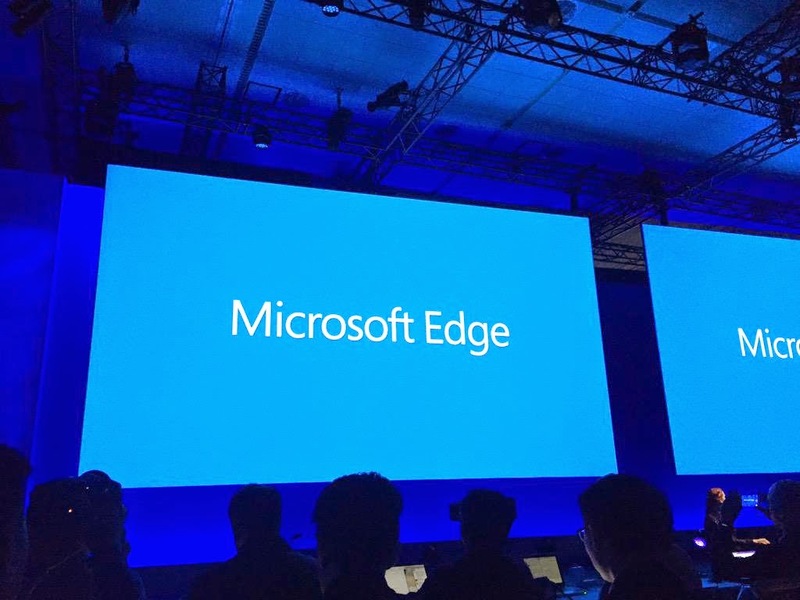 When you add up the specs, though, this really is a midrange phone. Hard-core Android enthusiasts likely won’t find the Moto X awe-inspiring. 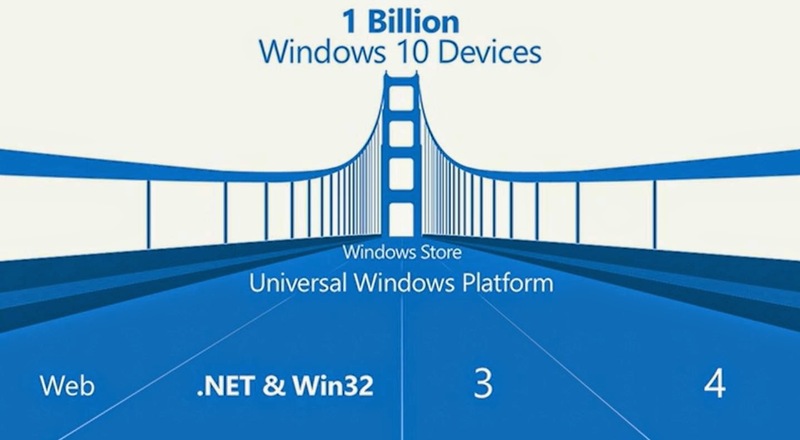 Expect the device to hit stores in late August/early September for a suggested price of $199.99. More impressive is that your custom phone will arrive on your doorstep within four days and is assembled in Ft. Worth, Texas. Yes, this is the first smartphone to be made in the U.S.
We need to spend a few more days with the Moto X before we know how we feel about it, and we wish we could actually try out Moto Maker for ourselves, but one thing is for certain: Motorola is finally making some moves with its unique blend of capabilities and design will prove valuable to ordinary consumers.